for Oskar Fischinger's films, paintings and other work. New Fischinger book! Oskar Fischinger: Experiments in Cinematic Abstraction (2013). Edited by Cindy Keefer and Jaap Guildemond, distributed by Thames & Hudson worldwide. Available now in UK & Europe; advance copies in North America through Center for Visual Music, Los Angeles. Cover images from the film Kreise. Tate Modern, London, June 2012 through March 2013. Whitney Museum, New York. "Oskar Fischinger: Space Light Art, A Film Environment." June through October 2012. The first DVD in a series, Oskar Fischinger: Ten Films. 2006 release. Order the first DVD through Center for Visual Music (CVM) in Los Angeles. If you are ordering for a school, university, library or institution please use the Institutional Order Form. Please note, this DVD may not be used for public performances or public exhibition..
"If you love animation, or modern art, or computer graphics, consider it a must" - Leonard Maltin. 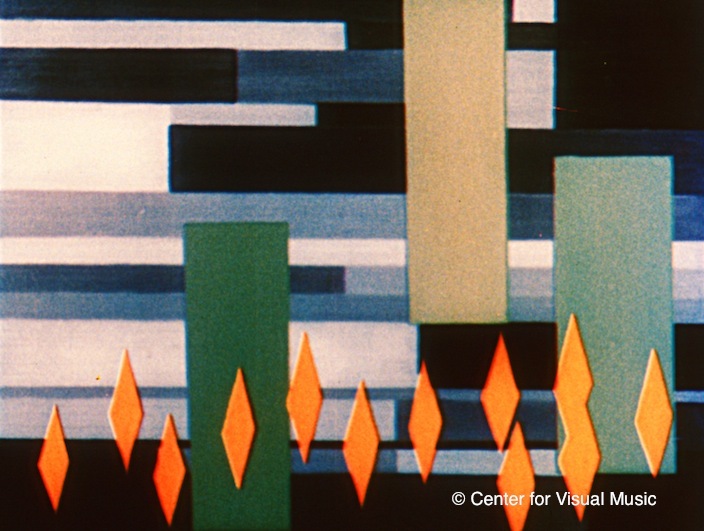 Contains ten of Fischinger's classic Visual Music films - Allegretto, Motion Painting No. 1, Radio Dynamics, Spiritual Constructions, Study nr. 6, Study nr. 7, Kreise, Spirals, Wax Experiments, Walking from Munich to Berlin, plus many Special Features: home movies from Fischinger's Berlin Studio c. 1931, never-released early animation tests and fragments, a selection of paintings by Fischinger, a selection of biographical photos, film notes by Fischinger and others, and a biography. Produced by Center for Visual Music in association with Fischinger Archive and Jack Rutberg Fine Arts. In the US, the DVD can also be purchased from CVM, and at selected museum bookshops such as the Whitney Museum, New York. In Europe, in London (BFI Southbank Filmshop), Paris (HEEZA), through Walter Koenig in Germany, and sometimes Image Movement in Berlin. A Retrospective Tribute of Oskar's films: Oskar Fischinger: Optical Poetry, featuring 35mm restored prints of Allegretto, Radio Dynamics, Kreise, Motion Painting No. 1, Study nr. 5, 6 and 7, American March, and other films is available for rental from Center for Visual Music, to venues capable of archival projection standards. There are 2 programs available, the first of popular classic Visual Music films, and a second program of Rarely-Seen works. Please contact CVM at least 30 days in advance of playdate. Contact cvmaccess (at) gmail (dot) com. The Retrospective contains many new preserved prints, preserved by The Fischinger Trust, the Academy Film Archives and others. Selected 35mm prints are also available for rental through Light Cone, Paris. Contact The Fischinger Trust at fischingerarchive@msn.com for other Licensing, Museum Exhibition Requests and Special Permissions. Please note that many requests are declined due to insufficient information, unacceptable spaces, or lack of preparation time or budget. For individual screening programs, such as single night screenings, the work should be screened on film. Requests to screen the films with new music or live scores - we do not give permission to screen Oskar's visual music (sound) films with new music. Requests may be considered for only a few of the silent films (not Radio Dynamics), please provide full information. Due to past problems, we do not license excerpts of the films for use in music videos. ONLINE examples of selected films including Studie nr 5, Studie nr 8, Kreise, Wax Experiments, the Lumigraph film and others are at CVM's vimeo channel. These are the only authorized clips online. Please direct requests for image reproduction permission, and other image permission requests to fischingerarchive@msn.com - please provide full and specific details regarding the publication and requested use (print only, ebook, online, etc; circulation or print run, editor of book if applicable, publication date, etc.). If you are seeking reproduction permission for images to accompany an article, please email text of the article as well. Requests generally require 2-4 weeks processing time. Permission is required before publishing a photograph of Fischinger, a still from his films or an image of his paintings. The Fischinger Trust is currently not open to the public. Also see William Moritz's Fischinger biography "Optical Poetry: The Life and Work of Oskar Fischinger" published in April 2004 by John Libbey & Co. Available on amazon.com worldwide. Fall 2015: One painting and three Fischinger films are part of the exhibition Art of Music at San Diego Museum of Art (California). Through February 2016. 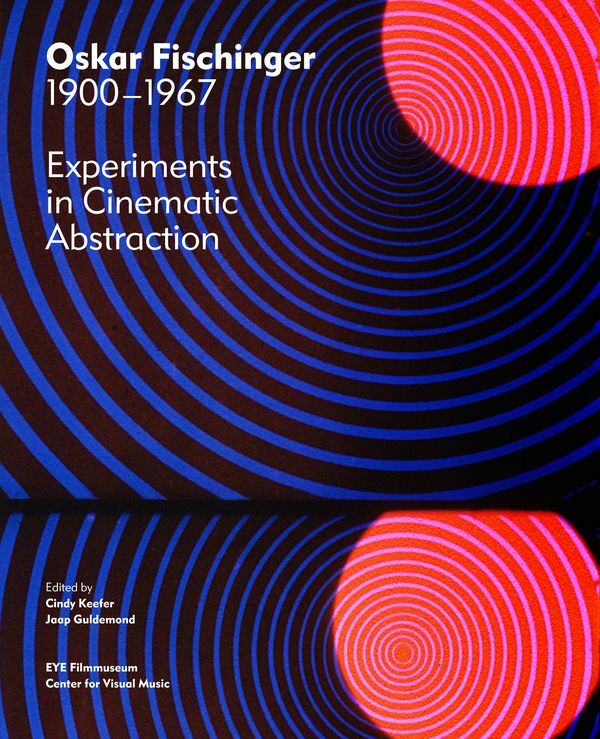 New Fischinger book: Oskar Fischinger (1900-1967): Experiments in Cinematic Abstraction. In distribution through Thames & Hudson. Edited by Cindy Keefer and Japp Guldemond. 2012: Fischinger films included in museum exhibitions in Venice, Italy; Mainz, Germany; Calgary, Canada; Taipei and other cities. Raumlichtkunst restoration/recreation project by Center for Visual Music, of Fischinger's 1920s multiple projector performances, is a 3 screen HD installation in selected museums, at The Whitney Museum, New York, 2012, and The Tate Modern, London, June 2012 - March 2013. Preserved with an Avant Garde Masters Grant, funded by the Film Foundation and administered by the National Film Preservation Foundation. Optical Poetry: Oskar Fischinger Retrospective screened at Tate Modern, London on June 1; at LA County Museum of Art, April 27, and Whitney Museum of Art, October 20, 2012. Featuring 35mm preserved prints of Fischinger's classic films, including Allegretto, Komposition in Blau, Motion Painting no. 1, Studies 5,6,7,8; Kreise, An American March, Radio Dynamics, Walking from Munich to Berlin, Spirals and more. Organized by Center for Visual Music. January 7, 2012 - Two part Optical Poetry: Fischinger Retrospective program screened at The National Gallery of Art, Washington DC. October 2011 - Lecture on Oskar Fischinger's Ornament Sound experiments, 1932-1950s, by Cindy Keefer at Seeing Sound 2 symposium, Bath, UK. Summer 2011 - Fischinger's film Radio Dynamics was in the Watch Me Move! huge animation exhibition at Barbican, London; now on tour for 5 years to Calgary, Canada then Asia. July 2011 - Large painting exhibition with dozens of Oskar's paintings, at Peyton-Wright Gallery, New Mexico. June 2011 - unshot animation from the Ornament Sound series was on view in The Unfinished Film at Gladstone Gallery, New York.. From the CVM Collection. May 2011 - Fischinger 2-part Retrospective screened at The Stuttgart International Animation Festival. September 2010: Celebrating Elfriede Fischinger on her 100th Birthday: A Benefit Exhibition and Reception, in Los Angeles. Hosted by Center for Visual Music in collaboration with The Goethe-Institut Los Angeles and The Fischinger Trust. This special evening featured an Exhibition of selected photographs and artifacts about Elfriede's life, paintings by Oskar Fischinger, a reception, and a Screening of Home Movies and Videos of Elfriede. Highlights include Oskar’s first Stereo Painting (1949), The Lumigraph film (1970) by Elfriede, and unshot animation drawings by Oskar. Fischinger films screened at The Tate Modern, London as part of the Expanded Cinema symposium, 2009. Leonardo Electronic Almanac published C. Keefer's article 'Raumlichtmusik' - Early 20th Century Abstract Cinema Immersive Environments. Leonardo Electronic Almanac, Creative Data Special Issue. Leonardo: The International Society for the Arts, Sciences, and Technology, and MIT Press. October 2009. PDF. 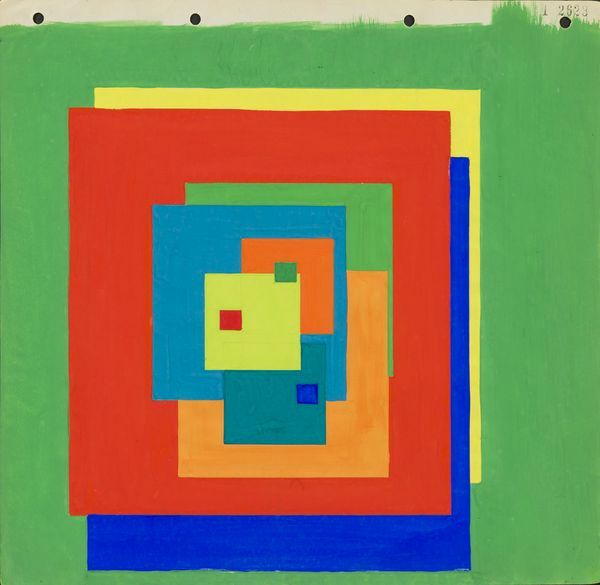 San Diego Museum of Art acquired a Fischinger painting. Three Oskar Fischinger paintings (including a 1944 oil on celotex) were in the exhibition Modernism and the Wichner Collection, at The Long Beach Museum of Art, Long Beach, CA, through August, 2009. November, 2008, Motion Painting No. 1 screened at Tate Modern, London. Sept-Nov, 2008: Original charcoal animation drawings from Studie nr. 8 exhibited at Akademie der Künste, Berlin, in the Notation exhibition. July, 2008. Il Cinema Ritrovato Festival, Bologna: Motion Painting No. 1 screened accompanied by the Bologna Orchestra at Piazza Maggiore in special Avant-Garde Evening event. 35mm. May 25, 2008: Screening of Oskar Fischinger: Optical Poetry Retrospective at Australian Cinematheque at Queensland Art Gallery/Gallery of Modern Art, Brisbane, Queensland, Australia..
November 3 - San Diego Museum of Art's Animation Symposium includes Oskar Fischinger and Visual Music Animation - Exhibition and Authenticity in the Age of Digital Reproduction, a lecture with film clips presented by Cindy Keefer of CVM. Fischinger's original Lumigraph was performed at the Deutsches Filmmuseum, Frankfurt, on February 2, 2007 by Barbara Fischinger, assisted by Cindy Keefer. 2006-08: Two Fischinger paintings were part of exhibitions: one in the spectacular The Société Anonyme: Modernism for America (see exhibition schedule for venues); which toured 2006-2008 at the Hammer Museum Los Angeles, and venues in Washington DC, Dallas, Nashville; and in 2010, Yale University, New Haven, CT. Another painting was exhibited at The Laguna Art Museum (California). Radio Dynamics, Study nr. 6 and Ornament Sound were in the ZKM exhibition Light Art from Artificial Light, Nov. 19, 2005 through August, 2006 at ZKM, Karlsruhe, Germany. English description. Oskar Fischinger Retrospective screened at Lincoln Center, New York January 2, 2006. Featuring 35mm prints preserved by the Academy Film Archive, Center for Visual Music and Fischinger Archive, with the support of Film Foundation, Sony, Deutsches Filmmuseum and Cinematheque Quebecoise. An IB Technicolor print of An Optical Poem screened, thanks to Warner Brothers. Show included many new prints, including R-1 ein Formspiel, Composition in Blue, Motion Painting, Study no. 7. www.filmlinc.com. View the Press Release. Read the Village Voice review. "Oskar Fischinger: Motion Paintings" Exhibition of Fischinger's paintings at Goethe-Institut, Washington DC, Sept. 8 - Oct. 26, 2005. Accompanying film screening: Oskar Fischinger Retrospective at Goethe, September 19. Fischinger in "Visual Music" exhibition press: Artforum magazine, October 2005 and also Summer issue 2005; Washington Post, July 1, 2005, Los Angeles Times, Los Angeles Weekly, Modern Painters (UK) September 2005, Wall Street Journal..
"Visual Music" exhibition at MOCA Los Angeles (Feb - May 2005) and The Hirshhorn Museum, Washington, DC (June 23 - September 11, 2005), included 5 Fischinger films plus animation drawings and Ornament Sound Experiments ephemera. More about the films in the exhibition (Allegretto, Radio Dynamics, Study nr. 7, Lumigraph film excerpt and Ornament Sound excerpt) can also be found at CVM's Visual Music films page. The exhibition catalog features many images and pages on Fischinger, and is available through amazon.com. 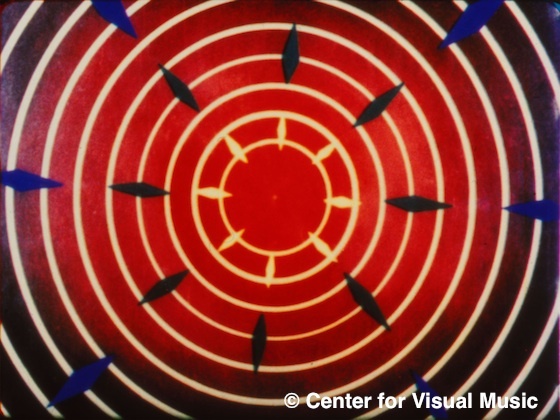 Fischinger films were also screened (on film) in Center for Visual Music's film screenings accompanying the exhibition. Sons et Lumiere exhibition at Centre Pompidou, Paris (Sept 2004-Jan 2005), included Fischinger's Ornament Sound and Studie 8 films, plus numerous Kreise animation drawings, Ornament Sound drawn sound strips and documentation, and several of his Fantasia-era sketches. The exhibition included work by Oskar's influences and contemporaries including Kandinsky, Klee, Pfenninger, John Cage, Schoenberg, Richter and many others. The exhibition catalog features a number of pages on Fischinger. Dr. William Moritz's long awaited biography "Optical Poetry: The Life and Work of Oskar Fischinger" was published in April 2004 by John Libbey & Co. It is distributed in the US by Indiana University Press, and available on amazon.com worldwide. In honor of the book release, events and screenings of Fischinger films were held in Los Angeles on March 14 (Filmforum) and March 17 (Cal Arts), and Pacific Film Archive, Berkeley on April 13, 2004. We are deeply saddened at the passing of our dear friend Bill Moritz, on March 12, 2004, in California. His passing leaves a great void in the film world and in our hearts. December 2003: The Oskar Fischinger Retrospective of 35mm films screens at Goethe-Institut London, and several venues in Scotland. Oskar's "3-D" Film tests screened at the World 3-D Film Expo at The Egyptian Theatre in Hollywood, CA, in Sept 2003. Beautiful new 35mm prints were produced for the festival, thanks to SabuCat Productions, Center for Visual Music and Triage Motion Picture Services, Hollywood. The Fischinger Archive expresses its sincere condolences on the passing of our friend Jules Engel in September 2003. Jules and Oskar met at Disney in 1939 where they became immediate friends, sharing and supporting each other's painting. We will miss this great talent and good friend. 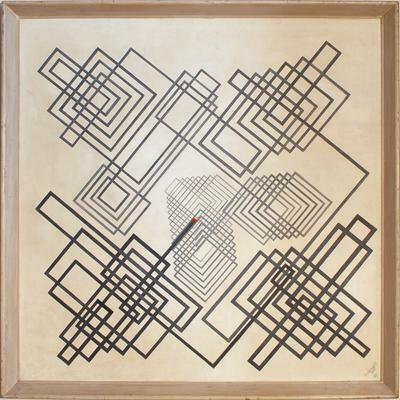 If you own a Fischinger painting, drawing, or cel, we would appreciate hearing from you. We are maintaining a catalog raisonne and documenting all of the paintings, and appreciate receiving information. Canemaker, John. The Original Laureate of an Abstract Poetry. New York Times, July 2, 2000 (update to this article: The Fischinger Archive no longer has any affiliation with Iota). Janiak, Larry and Dave Daruszka. Oskar Fischinger. 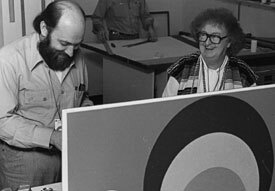 An Interview with Elfriede Fischinger. Zoetrope 1979. --"'Raumlichtmusik' - Early 20th Century Abstract Cinema Immersive Environments." Leonardo Electronic Almanac, Creative Data Special Issue, Vol 16, no 6-7. MIT Press/The International Society for the Arts, Sciences and Technology, October 2009. (PDF). Leslie, Dr. Esther. Where Abstraction and Comics Collide, Tate ETC, Tate Museums, UK, Summer 2006. -- The Private World of Oskar Fischinger. Liner notes, "The World of Oskar Fischinger" laserdisc, LaserDisc Corporation, Tokyo, 1988. -- "Non-Objective Film: The Second Generation." In Film as Film: Formal Experiment in Film, 1910-1975, Hayward Gallery/Arts Council of Great Britain, 1979. Fischinger excerpt from article. Tobias, James. Sync: Stylistics of Hieroglyphic Time. Temple University Press, 2010. 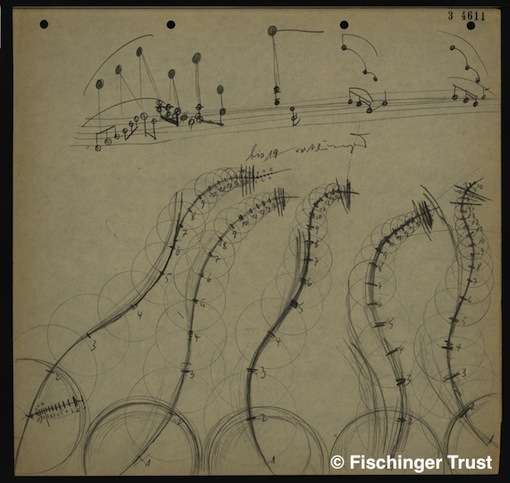 See Chapter 3: "For Love of Music: Oskar Fischinger's Modal, Musical Diagram." For an extensive bibliography please see CVM's Bibliography at their Fischinger research site. The Missing Link: Oskar Fischinger Between European Avant-Garde and New American Cinema, March 2002 by Walter Schobert, at Edinburgh, Scotland Conference "Avant-Garde"
The Fischinger Trust is also known as the Elfriede Fischinger Trust. Previously, Elfriede used the term "The Fischinger Archive" to conduct business. The Trust and Archive thanks The Deutsche Film Institut, The Academy Film Archive (Michael Pogorzelski - Director), The Whitney Museum, Tate Modern London, Michael Friend, Pacific Film Archive, Sony, John Canemaker, Center for Visual Music, Cinémathèque québécoise, Goethe Institut Los Angeles, Leonard Maltin, Jerry Beck, Joe Kennedy, Cecile Starr, Yann Beauvais, Jean-Paul Georgen, Heike Sperling, Thomas Reynolder, Timothy Finn, Susan Bolles and many others for their support. 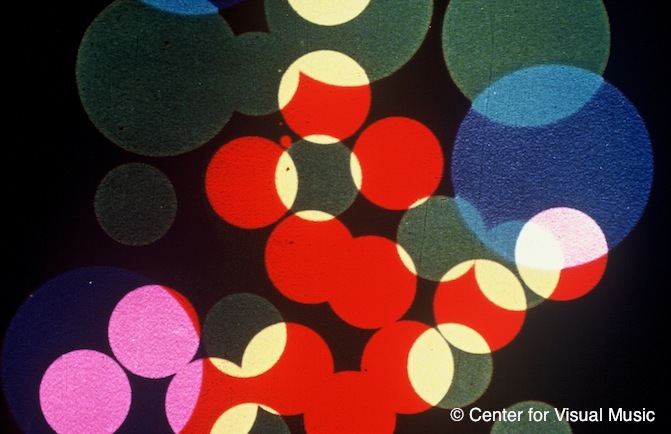 All images copyright The Elfriede Fischinger Trust and Oskar Fischinger, 1922-2015. Text and images in these pages are protected by copyright law (Title 17 U.S. Code). Please seek permission for reproducing any images or text.